It’s that time of year again… or at least it was. 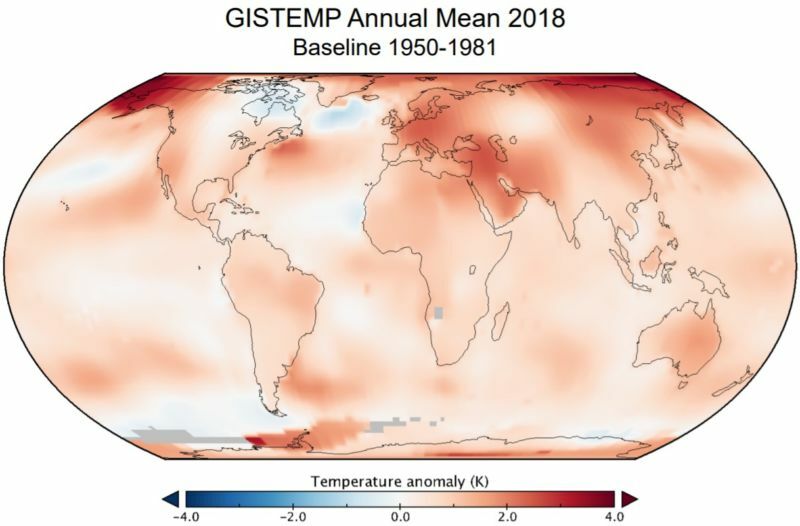 NASA and NOAA normally release the final global temperature data for the previous year around January 18, but the government shutdown delayed that release. It finally happened on Wednesday, with both agencies finding that 2018 ranks at number four on the ever-changing list of the warmest years on record. That matches the ranking from the independent Berkeley Earth dataset, which they released on January 24 by accessing raw US data during the shutdown. The UK Met Office also released its data today, ranking 2018 similarly. So why 4th place? Last year settles in just behind 2016, 2017, and 2015 as part of a continuing and human-caused global warming trend toward record temperatures—that’s the reason the top years are all quite recent. Whether a year wiggles into 5th or 1st depends primarily on short-term natural variability that’s layered on top of the human-driven trend.